When a chill starts to hang in the air and the leaves begin to fall, that means Halloween is near. 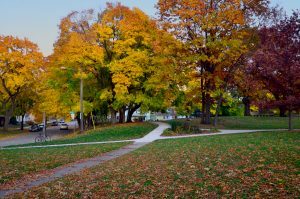 Madison Parks Hayrides is the perfect activity to get you excited for the fall and winter months instead of dreading their arrival. Since I have been born and raised in Los Angeles, the only times I truly get to see the stars is in the Midwest. Therefore, heading over to the Monona terrace in the fall to view the moon and other celestial objects is the perfect activity for a casual yet fun night. Instead of dreading the cold, dreary aspects of winter, bundle up and head to to Tenney Park to enjoy the snow with some fun outdoor activities! This park offers activities ranging from ice skating to snow mini golf. Another way to get into the fall spirit is at the Sun Prairie Fall Festival. Here you can find fun activities such as arts and crafts stations, face painting, and even horse drawn carriage rides! Fall is the best time to see the Packers play in person, so make sure to head over to a game in the fall before it gets too cold. A perfect way to spend a night!